This article was originally published in the June 2018 edition of WoJam Unlocked. Read the whole newsletter here. Where does one begin to explain the massive program at the next World Scout Jamboree? 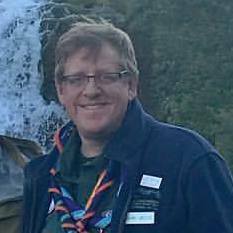 If a circus has three rings, the 2019 World Scout Jamboree will have more than a dozen! Let’s go for a virtual walk — scratch that, hike — around the Summit Bechtel Scout Reserve in Glen Jean, West Virginia to get an idea of a typical day might look like at the 2019 WSJ. First, a disclaimer. The program is still developing and not everything here may be 100% accurate at the time of the Jambo. Be prepared for change! We’re going on a virtual hike because this place is HUGE. I hope you are wearing a good (and waterproof) pair of boots, because we’ll be walking about 10 miles (16 km) today. I’ll meet you at your sub-camp HQ (the big white tent by your campsite). The Jamboree is really a city of 47,000 people camping in six basecamps with about four sub-camps per basecamp (a total of 19 sub-camps). If you do the math, that is about 2,500 Scouts per sub-camp. As we walk down the hill to the main program area, we pass units which are on their way to one of the many adventure experiences at the Summit. The Summit claims the longest zip line in North America and the second largest BMX bike center in the world. Some units will be going to Boulder Cove, which is the largest man-made outdoor climbing facility on the planet. Others are dressed to get wet and are following us to the waterfront to learn how to SCUBA dive and kayak. I heard that they got the dragon boats out for a race later today. Other units are heading over to the Bows and Barrels area to try their hand at shotgun shooting and tomahawk throwing. My favorite adventure is the canopy tour, which is a zip line course that takes you tree-to-tree, across rivers and ravines, through the thick deciduous forest of the Summit. These high adventure experiences, from mountain biking to white water rafting, are what the Summit is known for, and Scouts will have a chance nearly every day to try something new. The World Jamboree, however, offers so much more than high adventure and what you might find at a National Jamboree. Now that we’re down by the Summit Center (or Centre, if you are from Canada), let’s walk around the Global Development Village (GDV). There are hundreds of tents and displays put on by various Scouting organizations and Non-Governmental Organizations (NGOs). Here you will learn about how Scouts can support the United Nations Sustainable Development Goals and the initiatives of the World Organization of the Scout Movement (WOSM). The village has three main areas: Sustainable Development, Environment, and Peace. Scouts will learn how you can create a better world by reducing hunger, improving education, preserving the environment, and reducing inequalities, among other goals. 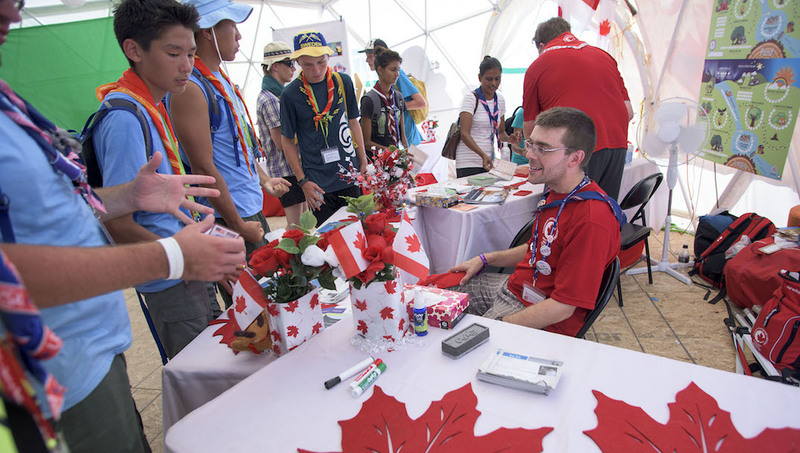 Most of the GDV exhibits and tents are abuzz with activity – this is an area to roll up your sleeves and participate with Scouts from all over the world. Let’s go over to the Centro Mondial (World Center) now. There are three activities here that I want to show you. The first is the Faith and Beliefs area. We’ll have a chance to worship here on “Scouts Own” day on Sunday, but today we can stop by and learn about a faith that we don’t know much about. All major religions are represented here. Nearby is the North American Dream area, where Canada, Mexico, and the United States have exhibits and activities that highlight our history and unique cultures. On the other side of the Centro Mondial is a futuristic program area where Scouts can learn new skills and create new ideas about food, exploration, communication, media, transportation, work and how to be a better global citizen. Time for lunch? I think so too. We packed a sandwich and a couple of water bottles for our trek, but let’s save the PB&J for later and head over to the Food Houses. Food Houses are mini-restaurants sponsored by different Scout organizations. They serve food indigenous to their country. What are you in the mood for today? Mexican burritos? British tea and biscuits (they look like cookies to me). Ethiopian injera and stew? Indian curry chicken? Or a burger from the USA Food House? You choose, it’s all good to me. Let me explain some of the random things you are seeing as you walk around. Yes, a lot of Scouts are on their smartphones. 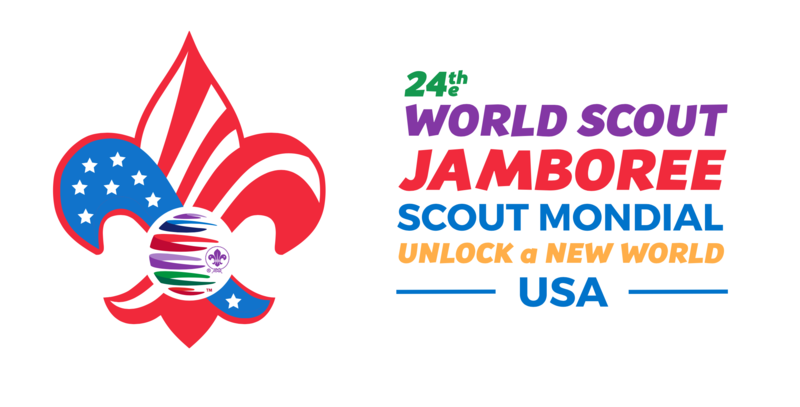 The WIFI is strong at the Summit, and the Jamboree has an interactive app that helps you connect with Scouts from other countries and keep track of your busy schedule. It also helps with hazardous weather alerts and information about special events. Also, Scouts LOVE to trade just about any kind of patch and neckerchief (and uniforms, and practically anything else). That’s why you see so many Scouts gathered under shade trees with twenty or thirty patches in front of them on the ground. Oh, and the music? That is a performance of the Indonesian Contingent down at World Point. Every day different contingents will put on concerts, dance performances, and other shows. Let’s head over there now. This is also the place for the Festival of Nations. Every country has an opportunity to put on a display or experience to showcase their culture and uniqueness of their country. This is a great place to get some cool swag and meet the contingent leaders from other countries. Let’s head back up the hill for dinner at our sub-camp. Some nights after dinner there is a stadium show or a basecamp “bash”, but tonight there is no formal program. It will give us a chance to visit some of the other contingents which camp near us. We’ve invited the Czech Contingent over for dessert (they are bringing trdelnik pastries and medovnik honey cake) and afterward I think we’ll head over to the UK/Scotland Contingent for their Ceilidh/Rave party by the sub-camp tent. Then, let’s get together with those Scouts from South Korea that we met at the GDV. Maybe, just maybe, we’ll get to bed by midnight. Thanks for walking the Jamboree with me. I’m looking forward to seeing you at the Summit in 2019!